Its that time again... OTBN - Open That Bottle Night, conceived for those that have a special bottle of wine or champagne hidden away being saved for a special occasion that for whatever reason hasn't happened. Every year since 2000, on the last Saturday night in February, Open That Bottle Night (OTBN) has been celebrated - the time to uncork and enjoy that cherished but here-to-for elusive bottle. OTBN was conceived by Dorothy J. Gaiter and John Brecher, wine columnists for the Wall St. Journal (wine@wsj.com). They realized they weren't alone - having that special bottle set aside for an occasion that just never happens. On this night, you don't need an excuse or a reason - just do it! Take advantage of OTBN to open that bottle and enjoy it! Enjoy it by yourself, or better yet, enjoy it with someone special, or with a group. Have everyone bring such a bottle and let the story telling begin, because amazingly, every OTBN bottle has a story or some meaning. Let the fun begin. So I spent the morning digging around in the cellar and found many candidates. So I decided to set aside those anniversary year bottles - those of the birth-years of the kids, and other special anniversary years. Those bottles have a reason for opening and their circumstances are set.Tonight is for that bottle lacking a reason - but for its own reason its special in some way. Here is a selection of bottles I found that were candidates - according to the criteria that they are getting old, need to be consumed and since I've been holding them for so long, they must be worthwhile and be for waiting for a reason. 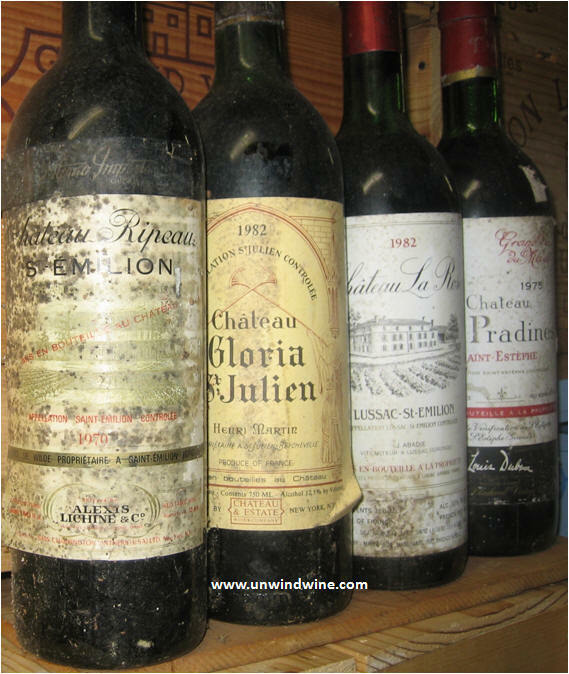 Why else would there be twenty, thirty-five (41 actually) year old bottles languishing down in the cellar!?! 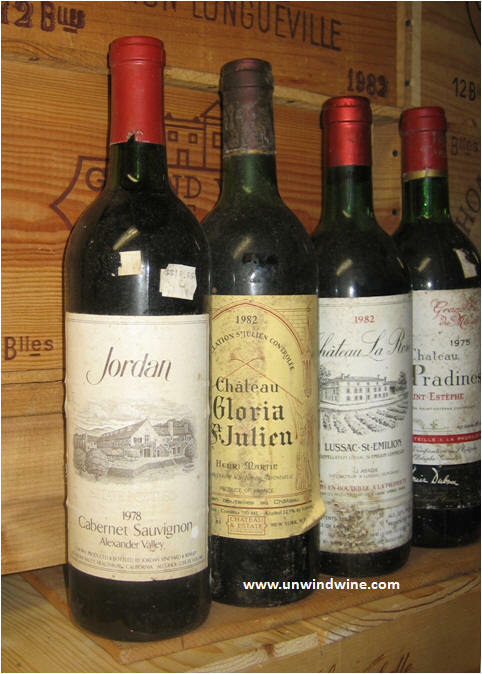 Several Bordeaux - two from 1982 - okay set those aside - birth year of #1 son, a 1975, and a 1970 - okay high school graduation year.. tonight? 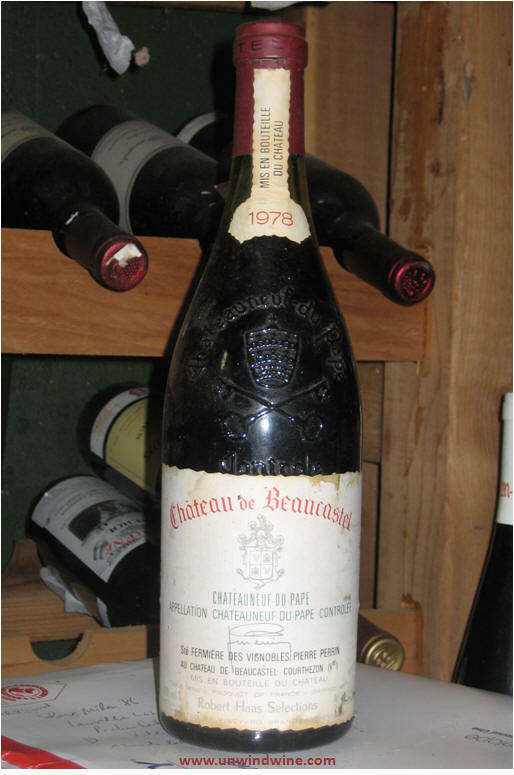 Here is my selection for OTBN 2011 - Château de Beaucastel Châteauneuf du Pape 1978 . More to follow as the saga/evening unfolds and the OTBN selection (s) is unveiled - er uncorked ! Final Flight - OTBN Selection - Château de Beaucastel Châteauneuf du Pape 1978, Jordan Alexander Valley Cabernet Sauvignon 1978, Cliff Lede Howell Mtn Chardonnay 2004, Freemark Abbey Edelwein Johannisberg Riesling Late Harvest Gold 1999, Domaine Bruco Clair Cazetiers Premiere Cru Gevrey Chambertin Borgnogne 1993 and Freemark Abbey Bosche Vineyard Cabernet Sauvignon 1986 (brought by Bill), Redheads Studio Return of the Living Red Cabernet Touriga NV (brought by Dan), and Clarendon Hills Baker's Gully Vineyard Clarendon Syrah 2003. 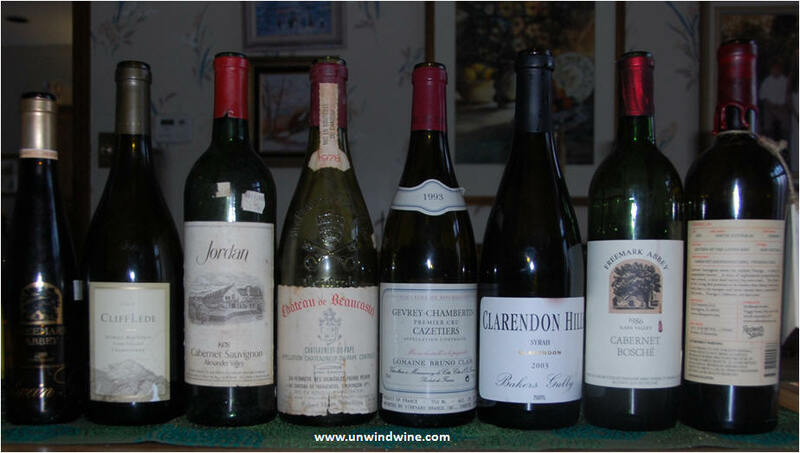 The wines accompanied a dinner of beef tenderloin, medallions of lobster, twice baked potato, and salad, followed by fresh fruits and chocolate fondue. Starters included artisan cheeses - Fair Oaks Farm five year old aged sharp cheddar, blueberry infused goat cheese, and a selection of olives. Attendees were Rick & Linda, Bill & Beth, Dr Dan & Linda, and Lyle and Terry. 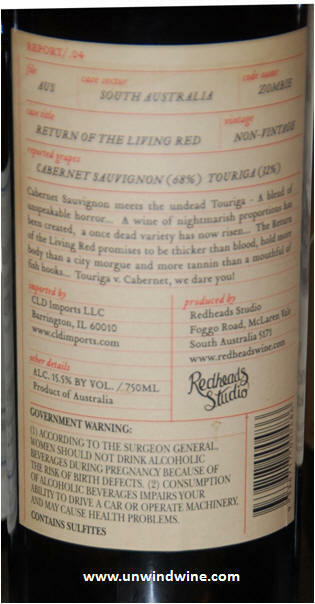 Interesting blend of NV (non-vintage) Australian Cabernet Sauvignon and Touriga, a 'lost' varietal - hence the name. Dark garnet color, full bodied, thick chewy, almost shiraz like coating the tongue - forward black and blue fruits, ripe black raspberry turns to a tone of spice, hint of cedar and kirsch on a full, moderate soft chewy tannin finish. Brought by Dr Dan. The bottle was a gift from his brother. Clarendon Hills Baker's Gully Vineyard Clarendon Syrah 2003 - RM 91 points: Dark garnet inky color. Full bodied, thick chewy, almost coating the tongue - forward black and blue fruits, ripe black raspberry turns to a tone of spice, hint of cedar and kirsch with a slight metallic/mineral undertone - ends with a full, moderate soft chewy tannin finish. Freemark Abbey Cabernet Sauvignon Bosché Vineyard 1986 - RM 90 points. Dark purple color - medium - full bodied. Surprising vibrancy, breadth and depth to this 25 year old! Full forward fruit of black raspberry, black berry, and black cherry with a subtle tart tone, hints of leather and anise with moderate well integrated tannins on a lingering finish. Perhaps the surprise of the OTBN evening. Freemark Abbey Edelwein Johannisberg Riesling Late Harvest Gold 1999 - RM 90 - Weak tea colored, medium-full bodied honey citrus flavors - slightly more subdued than last tasting two years ago, with a slight smokey finish.